Beautiful Flowers Garden: Beautiful Ladybug feeder. Aphids are the most common garden pest. Luckily, one ladybug can eat dozens of aphids a day, seeking them out wherever they hide. Ladybugs also prey on mealybugs, scale, leaf hoppers and mites. Bait these natural bamboo feeding stations with a raisin or two to welcome ladybugs into your garden and provide food when aphids are scarce. Beautiful Ladybug feeder. Aphids are the most common garden pest. Luckily, one ladybug can eat dozens of aphids a day, seeking them out wherever they hide. Ladybugs also prey on mealybugs, scale, leaf hoppers and mites. 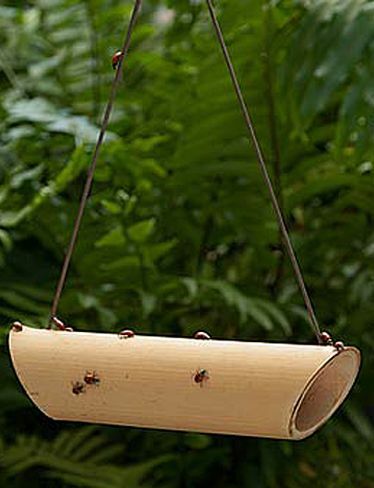 Bait these natural bamboo feeding stations with a raisin or two to welcome ladybugs into your garden and provide food when aphids are scarce.